Wine was not served. Kitchen renovations were not complimented. The idiosyncrasies of husbands and children were not discussed. But it was a book club meeting all the same, and in fact, the nine members were children. 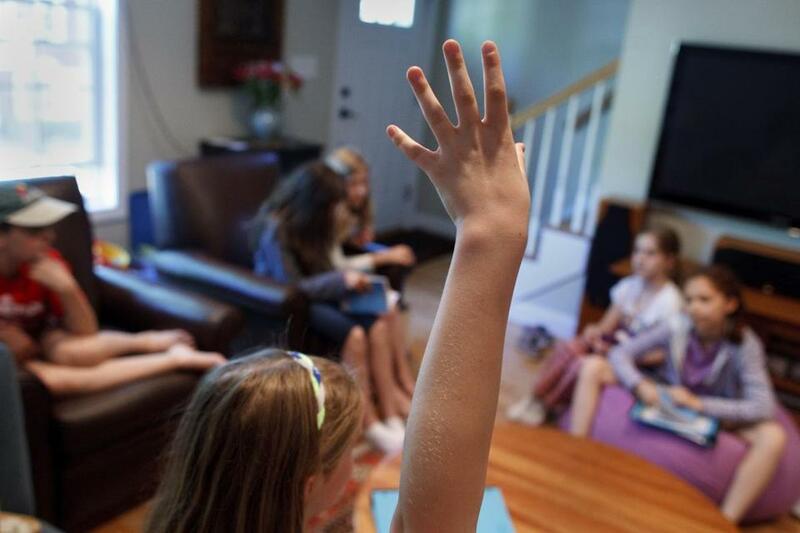 Aside from the fact that they raised their hands when they had something to say and had actually read the book, the Arlington fourth graders had the book club M.O. down. “You’re fancy,” Olivia said to Lillian, who’d arrived straight from a piano recital, resplendent in a dress and cardigan. 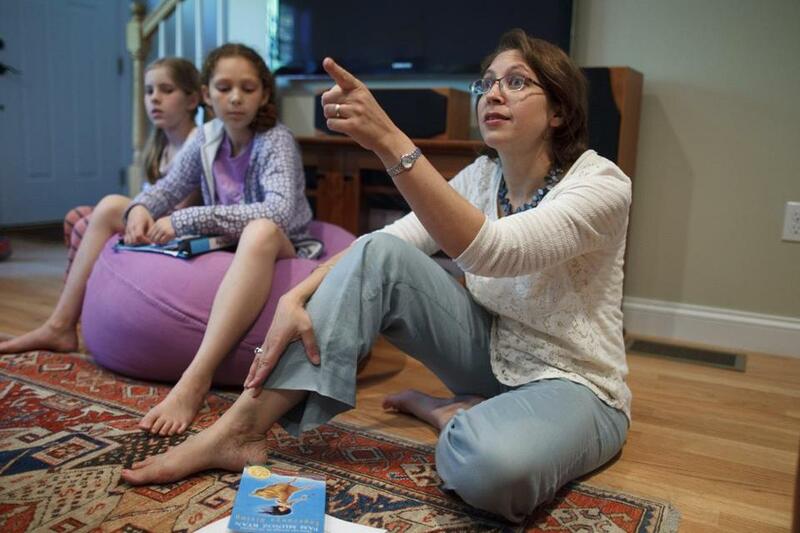 Despite the prevailing belief that kids today are too over-scheduled or screen-obsessed to read, book clubs for kids are hot. 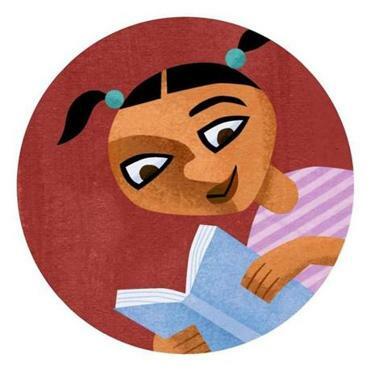 There are mom-and-kid clubs, dad-and-kid clubs, clubs run by indie bookstores, libraries, schools. Sometimes the kids themselves push to form a club. Sometimes their parents do. As the author of a forthcoming historical novel set in India, a Brown University graduate with a master’s degree from MIT, and a woman who spent hours reading in her hometown Paris, Mitter Duva found herself disappointed in the third-grade literary scene in her Boston suburb. That pact led to a warm reception when Mitter Duva suggested she and her daughter host a book club. For the first meeting, in February 2013, Mitter Duva choose the book – “The Secret Garden,” by Frances Hodgson Burnett — but now she gives the girls several choices, and the selection goes to a vote. The group of fourth-grade girls at Anjali Duva's home. The girls don’t have to finish a book they don’t like, but they do have to read at least one third, and come prepared to explain their opinion. So far they’ve read — and liked — “Island’s End,” “Bridge to Terabithia,” “One Crazy Summer,” and “Out of My Mind,” among others. On a recent Sunday, the book was “Esperanza Rising,” an award-winning novel set in 1930 that traces a Mexican girl’s fall from riches, when her father’s murder forces her and her mama to flee to California, where they live in a camp for Mexican farm workers. “Does anyone know when this took place?” Mitter Duva asked the girls, as they nestled on couches, chairs, and a big bean bag. “It was during the Great Depression,” Olivia said. Sasha’s hand continued its enthusiastic waving. “I see your hand Sasha,” Mitter Duva said. Pretty soon, 45 minutes had elapsed, and the group began agitating for a snack and a vote on the next book. “The Secrets of the Immortal Nicholas Flamel” won in an eyes-closed vote, and then it was time to move to the deck for snacks. As always, they were on-theme. In this case, grapes, mango, papaya, hibiscus punch, and burritos. Mitter Duva, too, morphed, from the calmest educator possible, into a human mother. “I need a glass of wine,” she said. The Arlington fourth graders had the book club M.O. down.